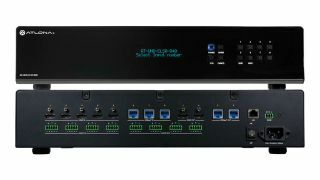 The What: Adding a new member at the top of its line of commercial market AV matrix switchers, Atlona introduced the AT-UHD-CLSO-840, an eight-input, four-output 4K HDMI and HDBaseT switcher designed for applications including videoconferencing, multi-screen presentations, and divisible room installations often specified for classroom, corporate, or hospitality environments. The What Else: The new matrix is equipped with five HDMI and three HDBaseT inputs, two HDMI outputs, and two HDBaseT outputs. Its audio capabilities include an independent 8x4 audio matrix using audio de-embedded from the video sources with matrix switching to four balanced, analog audio outputs. There are also four analog audio inputs, each dedicated to embedding content onto a corresponding video output. Other advanced features on the CLSO-840 include PoE on the HDBaseT inputs and outputs, allowing use of Atlona UHD-EX Series or HDVS-200 Series HDBaseT transmitters and receivers, and eliminating the need for separate power supplies for remote components. All HDBaseT inputs and outputs allow transmission distances up to 100 meters (330 feet). The new matrix includes a LAN connection for IP-based control, including configuration and monitoring via Atlona Management System (AMS) software, available to customers via free download. It can extend ethernet from a control processor, and features IP to RS-232 translation for converting TCP/IP commands to RS-232. This provides the flexibility of extending TCP/IP or RS-232 control to remote devices over HDBaseT. Audio output on each channel has independent volume control and five-band equalization. The matrix also provides HDCP management, enabling Apple sources to perform properly when used in teleconferencing systems. The Bottom Line: The AT-UHD-CLSO-840 is envisioned for use in a variety of meeting room settings, such as videoconferencing suites requiring at least three independent outputs for connections to displays and a conferencing codec. It is rack mountable in a 2U rack space, and will be available in Q1 2017 at a suggested retail price of $4,999.99.